In this ground breaking, award winning SEO course that has been taken by over 10,000 students and has an acceptence rate of over 95%. In it we will walk you through how to think like a search engine while keeping top of mind your users. This course bundle includes 6 modules each targeted in the steps involved in creating and tweaking your web site no users to site that is easily consumed by search engines. In part one of our SEO for content creators bundle. In this part we will get to know the actual web site we will be working on promoting. In this part we get our hands dirty as we learn the core HTML tags that every SEO person must know. By the end of this module you will know how to work with all the major HTML tags and understand there importance when it comes to SEO work. Welcome to our bonus section of our HTML training in it we will walk through the critical HTML tags that are mandatory for any SEO expert. If you find this topics interesting and want to dig deeper into HTML %u2013 I strongly encourage that you can find it here. 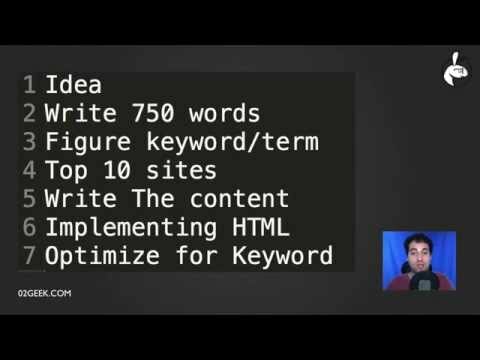 In this session we will walk through all the critical HTML tags that we will be working with as we optimize our HTML code to make it more visible on search engines. Figuring out what editor to work with. We will talk briefly about editors. If you want to work with the same editor that we are working with throughout our training you can find it here. The core HTML tags: HTML,HEAD and BODY. The core HTML tags are the tags every single HTML page should have. We will walk through the basics of it and understand what they do and why they do it. The HTML Title. The TITLE tag that is located within the HEAD area of the html page is a tag that enables us to give a title to the page. This title is not visible on the page itself but is part of the wrapper of the page. In other words we can usually see it in the window bar itself (outside of the page itself). And it is usually used as the search result copy when users search the web. We will learn how to work with this tag and integrate it into an HTML page. By the way in a later segment we will walk through the steps that optimize our final page. Headlines are more important that you might think. As search engines scan your web page they try to figure out what is more important and what is less so. One of the most effective ways search engines scan a page is by figuring out the main content in the paragraphs and understanding the headlines in the pages. In HTML there are 6 type of headlines marked with the tags H1-H6. We will see how to work with these tags and understand more deeply there value and importance. Every web page has copy and search engines live and breath copy. On of the challenges of getting your content to be high on search engines is that search engines love copy the more copy the happier they are but users in general prefer less copy and more visuals. To add large block of copy we will use the paragraph tag. As we mentioned earlier search engines don't treat every copy equality but try hard to figure out the most important content in a page. To help search engines and users discover the critical copy on a page we use the B or STRONG tags. We will learn about the differences between them in this session and understand how to work with them effectively. The web is visual but search engines don't really read images very well (Although they do read images) they don't do a great job at it our job as SEO experts is to help search engines understand what is inside of the images and at the same time add value to users with impaired sight. We will learn all about how to make our images more accessible for search engines and users. The web is full of links and they still have a very important weight on search engines. Both links from external sites into your site but of links within your site that establish the importance and depth of pages and relationships within your site. The more networked your site is the more chances users will dig deeper into your content as well. As such we will learn the basics of links and how to get them to work on our site. We will wrap up our talk about links with the 'nofollow' tag that we will add into pages that we don't want to send out our %u201Cstreet%u201D credit onto them.